The Sentinel is the smallest store in the range. It is ideal for those with limited storage space or those requiring a secondary store. The Stowaway is perfect if you require a storage space of moderate size. 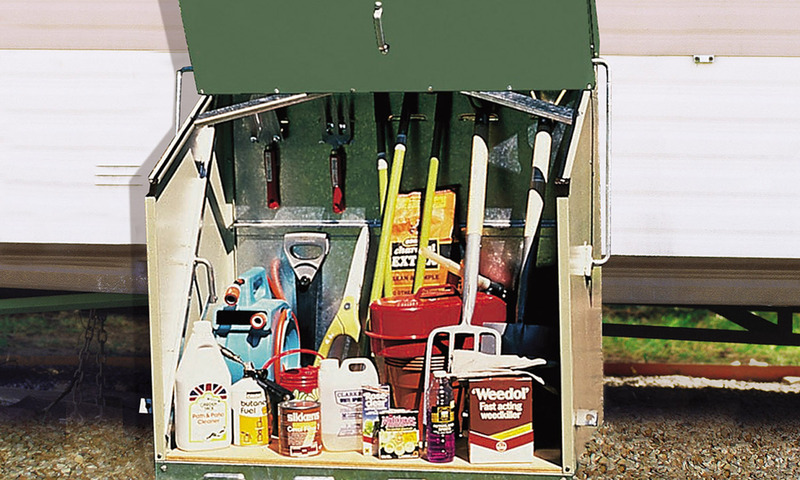 Compact and useful - our original Mobile Home Store. The Storeguard is our most popular product. 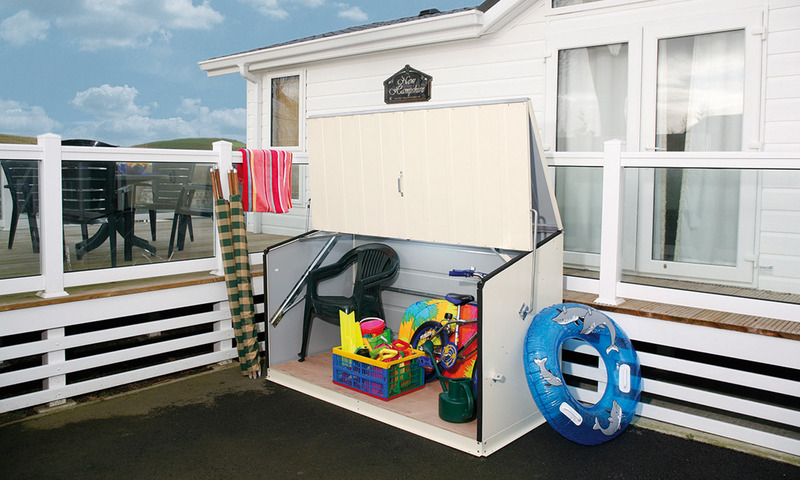 Its ample size allows for a huge storage area - the UK's No 1 Mobile Home Store. The Bike Store is the largest model and can store up to three adult bikes. 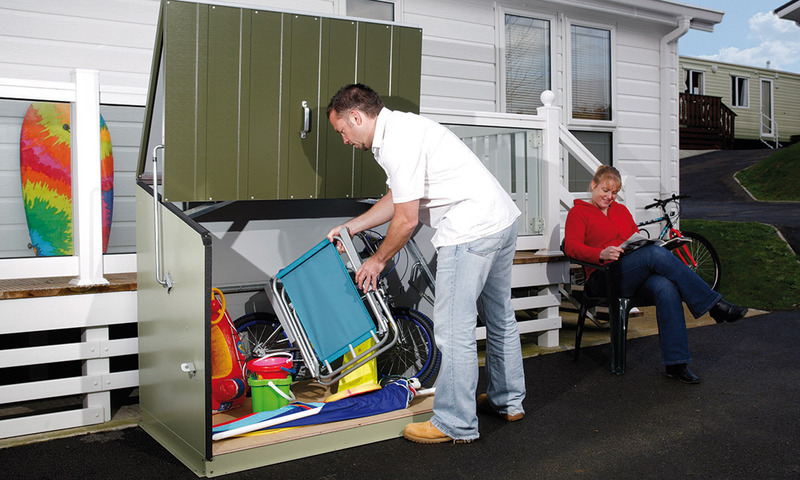 Also ideal for general storage – this has fast become a favourite with mobile home owners. H 52.5" x W 77" x D 35"
The Senator store features a full length shelf and has a removable lower front panel to maximise storage area. 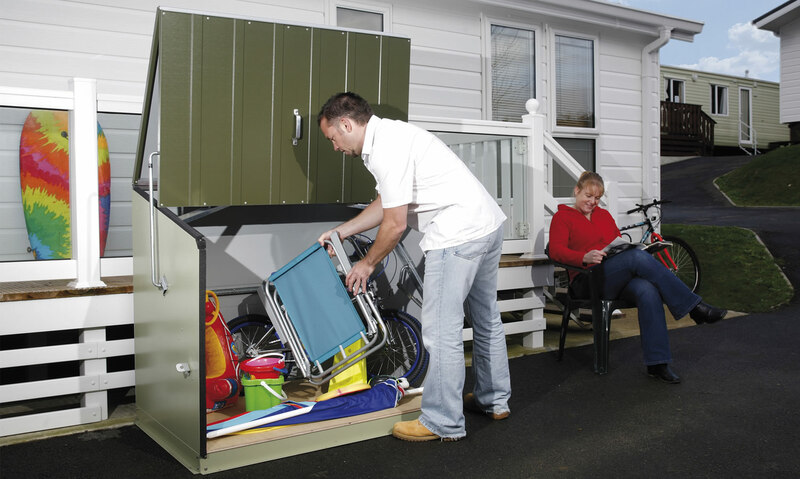 Our comprehensive range of storage units have proved immensely popular for static caravan and holiday home parks. 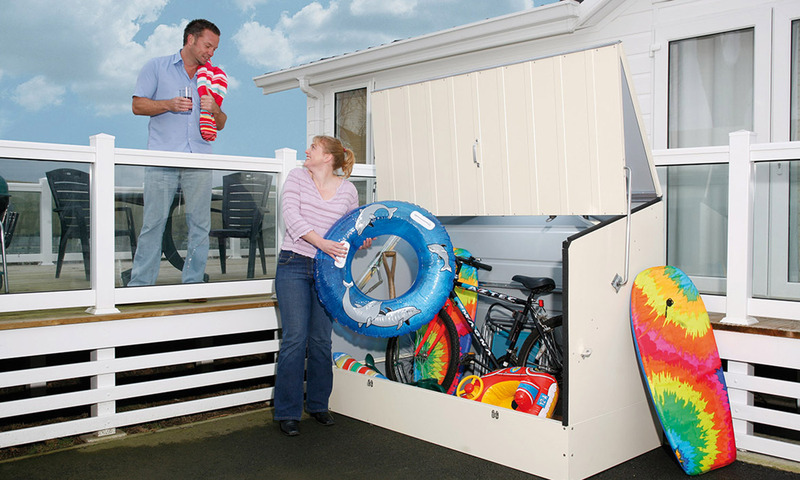 They offer safe, dry and secure storage for all those items you don't want to keep inside your home. Unlike wooden or plastic alternatives, all our stores are fire-resistant (a certificate is supplied with each product) and they will not warp, become weak and brittle, crack or discolour over time, even in coastal locations thus offering excellent value for money long term. The unique all metal construction gives strength with security and with the option of up to four locking points (with optional hasp and padlock sets) all your stored items are very well protected. One of the most important features of our stores is the unique and easy to use spring assisted opening action which allows complete "walk in" access. With this design heavy or awkward lifting is all but eliminated as stored items are easily accessible. 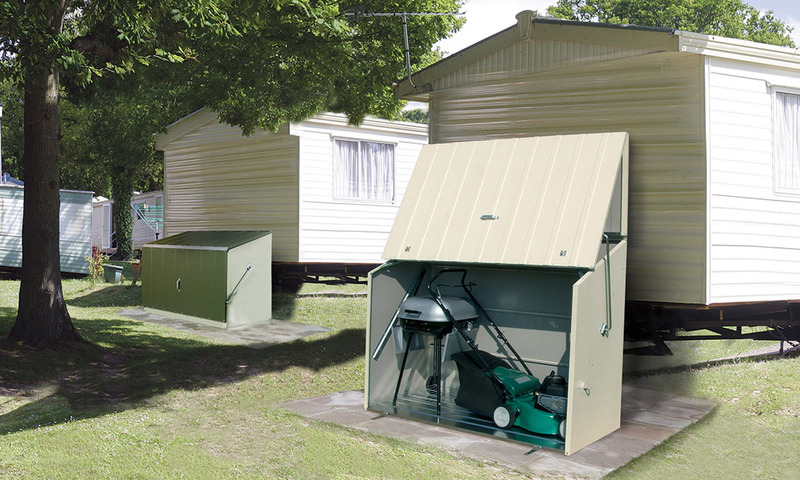 All static caravan storage units are manufactured in the UK using PVC-coated galvanised steel which is maintenance-free, fire-resistant and guaranteed for 25 years, ensuring lasting good looks and trouble free use even in harsh coastal locations. 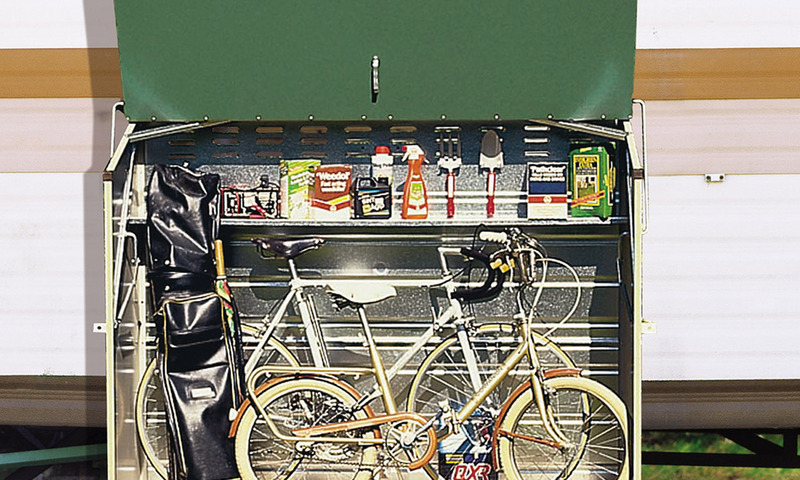 The Storeguard and Bicycle Store are available in a choice of colours - the original Olive Green which is popular in forest or lakeland areas or Cream which has been carefully selected to blend as closely as possible with the panels featured on many static caravans. Other units in the range is currently available in olive only. All static caravans are supplied in a convenient flat pack and are simple to construct as all major components are factory assembled for you, they come complete with all necessary fixings and easy to follow illustrated assembly instructions. Trimetals Stores are especially suited for use on parks and were originally designed to replace wooden and plastic boxes which are now restricted due to fire risks. Our stores have many clear advantages and are available in sizes large enough to store outdoor furniture and adult bicycles.